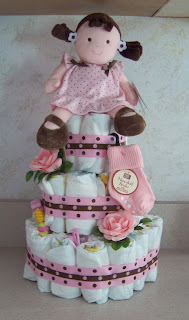 This is my first attempt at making a diaper cake. It was SO MUCH FUN to shop for and do up. Lots of little things hidden inside the cake, and a few on the outside. My favorite part is the dolly on top the cake. I so wanted an extra cute/soft topper, and was never so happy to spot this little gal at Wal-mart.